Snap is unlocking a new revenue stream while giving you something to do in between chats and Stories. Today Snapchat debuts its Snap Games platform that lets you play real-time, multiplayer games while texting and talking with your friends. The platform is based off Snap’s secret late-2017 acquisition of PrettyGreat, an Australian game studio with talent from Halfbrick which built Fruit Ninja. 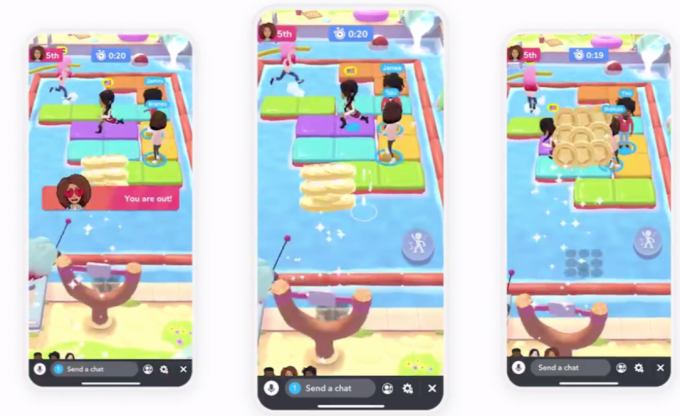 That team built Bitmoji Party, a Mario Party-style mini-game fest, to show off the platform that includes five games from developers like Zynga and ZeptoLab. The games are rolling out worldwide on iOS and Android starting today. Snap announced the new Snap Games platform at its first-ever press event, the Snap Partner Summit in Los Angeles where it also announced an augmented reality utility platform called Scan, an ads network, and a way to put its Stories in other apps. The Information’s Tom Dotan and Amir Efrati first reported Snap was building a gaming platform and Cheddar’s Alex Heath reported it would end up launching today. Snap Games could be considered a real-time spin on Facebook Messenger’s Instant Games platform, which has focused on porting well-known games like Pac-Man and other arcade titles to HTML5 . Similarly, Snap Games don’t have to be downloaded separately as they’re piped in from the web. Users can browse available games by tapping a new rocket ship button in the chat bar.